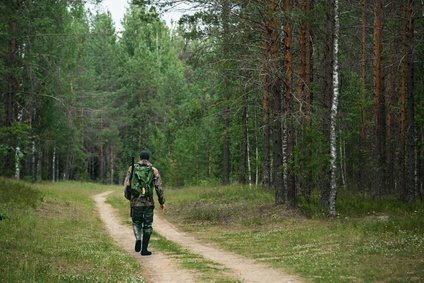 If you’re going to be spending a lot of time out in the wilderness tracking your target, it’s worth getting yourself the best hunting boots to ensure you remain comfortable throughout. They are as tough and durable as traditional hiking boots, but also have features to reduce the impacts felt on your feet so you can concentrate on the job at hand. In this article we will be taking a look at hunting boots reviews to help you decide which ones are right for you. There’s no point in buying some proper boots unless you ensure that they will fit your feet perfectly. If they are too tight or too loose your feet will rub against them on the long walks, and this will make things very uncomfortable. When trying boots on you should also be wearing the same socks that you plan on wearing on the hunt. The main reason people find themselves with ill fitting boots is because they were wearing much thinner socks when trying them out. If you prefer wearing a wool sock or a liner sock then you must take this into account when choosing the size. The insulation that your boots provide is the main thing that will determine how warm your feet feel. The level of insulation you need will vary depending on the activity you are taking part in and the time of year that you are doing it. If, for example, you will be sitting in a duck blind in low temperatures, then you will need much more insulation than if you are constantly walking across hilly terrain in a warmer climate. No matter what or where you are hunting, it’s likely that you’ll ne encountering water at some point. This can either be by crossing streams of ponds, or simply because most hunters will start early in the morning when there is still dew on the ground. It will make for a miserable day if your boots aren’t adequately waterproofed to protect you from this, so make sure any pair that you consider buying are before making your purchase. This can be by constructing the boots from a naturally water resistant material, or by including a waterproof liner within the boot to keep your feet dry. There are three different types of boots that are suited to hunting, each of which is more suited to some activities over others. Upland boots are lightweight hunting boots, and are ideal for hunts that involve covering large distances when every extra pound that you have to carry with you will make a difference. This is particularly useful for bird hunters, where the ability to move quickly is far more important than sturdiness. They don’t provide as much support or traction as other boots, they don’t collect as much heavy mud or dirt as you walk, and will come in different versions with varying insulation. Multi-Purpose hunting boots are the largest category of products and are designed to cover you for as wide a range of activities as possible. They are not a specialized for certain uses as other boots, though, so won’t be able to provide you with the ultimate comfort. They are designed to be durable, provide good traction across all surfaces, and are available with varying levels of insulation to suit your requirements. 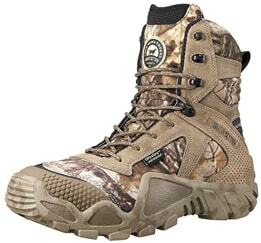 These boots from Kamik will keep your feet feeling comfortable and safe no matter what terrain you are tackling. They are made with a waterproof suede, which along with the seam-sealed build will prevent water from getting in. They are really easy to put on and take off with the rustproof speed lacing system, and the rugged rubber outsole will provide you with grip and traction on all surfaces. The removable foam liner will keep your feet feeling warm in temperatures as low as minus 40 degrees Fahrenheit, but there are further features to ensure comfort. The cushioned foot bed feels great against the soles of your feet and doubles up as a shock absorber to reduce the load that is felt on your ankles. A moisture-wicking lining and breathable materials will keep you feet feeling fresh, and the padded tongue and collar prevent material from falling inside, as well as protecting your feet from rubbing against the boot and developing blisters. The Bogs High Classic boots have been engineered to be incredibly tough, dependable and warm. They are completely waterproof and will keep your feet feeling comfortable even if the temperature outside has fallen to minus 40 degrees Fahrenheit. The inclusion of a moisture wicking sock-liner will reduce any unwanted heat and remove any sweat, and the antibacterial insole stops and odors from developing. The design of the boot, that reaches knee high, is perfectly suited for walking across all terrains, because it protects your lower legs, adds extra support, and stops dirt from getting inside. ​The boot opening is 16 inches around and is easy to put on and take off without compromising on giving you a tight fit. They are available in a wide range of sizes, and there are three different color options to suit your tastes. 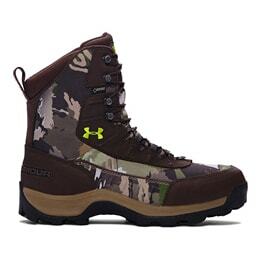 Under Armour have designed these boots to be as practical as possible while still providing you with the protection and comfort you need while out on a hunting trip. ​They have 800g of Primaloft insulation that is lightweight, but will keep you feet feeling warm in most environments. This material is also breathable so air flow within the boot is maintained so your feet feel fresh, with any sweat being quickly removed so you remain dry. The UA Scent Control Technology is a nice addition that prevents any odors from developing after a long day out, and the rigid structure of these boots provides your feet and ankles with ample support so they won’t be left feeling strained or tired. A memory foam top layer further adds to the overall comfort, and the lightweight materials used in the construction of these boots reduces the loads that are being exerted on you with each step. The adjustable speed lacing system helps to quickly put these boots on and take them off, and will give you a snug, secure fit. The outsole, as you would expect, is made from tough rubber and provides a good level of grip across slippery and dry surfaces. 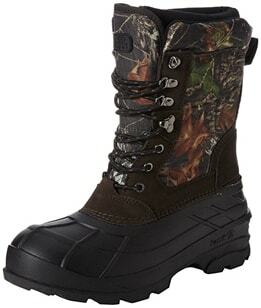 These boots from Irish Setter offer an extremely lightweight option without sacrificing on comfort or durability. They have managed to do this by incorporating their RPM technology that utilizes a composite material that means the boots weigh 40% less than traditional ones. 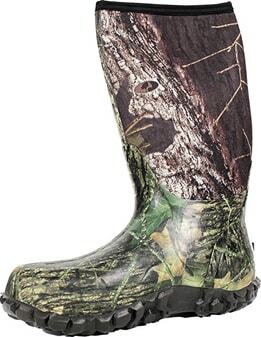 Your feet will feel fresh and comfortable in these boots with the combination of UltraDry technology, which uses a moisture management lining and waterproof upper design o keep liquid out, and the ScentBan technology that is applied to all parts of the inner boot and kills off the bacteria that would otherwise cause an odor. The lightweight nature of this boot makes it feel more like an athletic shoe than a hunting boot, but this doesn’t mean that you won’t get the protection and warmth you require. Quite the opposite in fact- they provide a great deal of support, will keep you dry in even the most testing of situations, and allow you to focus on the hunt instead of being constantly bothered by painful feet, which is what makes this one of the best hunting boots available. If you’re planning on a long hunt in particularly cold conditions, then these boots from Guide Gear are well worth taking a look at. They include 2,400 grams of Thinsulate insulation, and will keep your feet feeling toasty no matter the weather or places that you are walking through. The sure grip outsole provides an impressive amount of traction, even on oily surfaces, so you will be able to confidently move about without the risk of slipping over. These boots, unlike the others, also have rubber toe and heel caps to provide protection against knocks and bumps, with the rest of the sturdily built boot providing further protection and support to your ankles. When you are out on a hunt you want to be able to focus on the activity rather than being concerned about your feet and how protected they are against the unpredictable conditions. You should also ensure that you have a fully stocked first aid kit on hand. 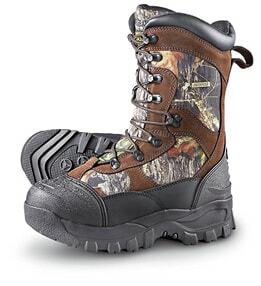 The best hunting boots will keep your feet feeling warm and comfortable and allow you to keep going all day long.